The first women to join the ranks of the Chelsea pensioners have been welcomed with a ceremony. Dorothy Hughes, 85, from Oxford, who was a gunner and Winifred Phillips, 82, who is from Deal, Kent, was a former Auxiliary Territorial Service member. They will live alongside more than 300 men at the Royal Chelsea Hospital in west London and wear the red coat. General Lord Walker, governor of the Chelsea pensioners, said it was "an historic moment". 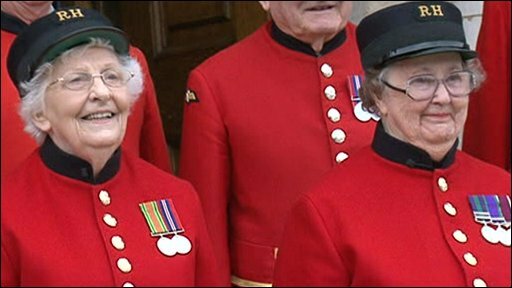 The decision to open up membership of the Chelsea pensioners reflects the growing number of women who have joined the army since the 1950s. Ms Phillips, who served in the Army for 22 years, said she raised the question of why women were not allowed to become members a decade ago. Now she has seen her wish come true. "Then they wrote back to me later saying they agreed, but it's taken me 10 years to get here." Declaring "I like men," she added: "It's been fabulous. It's just like the Army all over again but you don't have so much to do." The new women pensioners will wear specially adapted scarlet coats while off site and blue tunics while on it. There is even talk of designing an official handbag. Like the male veterans, the women must also meet the criteria of being over 65, free of a dependent spouse and receiving an Army pension. The Royal Hospital was founded in 1682 for the "succour and relief of veterans broken by age and war". Designed by Sir Christopher Wren, it currently houses more than 300 In-Pensioners, as the veterans are officially known. Rooms known as the Long Wards have been modernised to make them en-suite so that women can move in. Gen Lord Walker said: "The entry of our first lady Chelsea pensioners is an historic moment to which we have all been looking forward. "We have seen very clearly the role which women play in our armed forces today and it has been this way for most of the last century. "Their entry here after service to their country is, and is recognised to be, absolutely as a right." The Royal Hospital is partly government-funded, but also relies on donations for major projects.